How many people do you know who truly understand that in so many ways, the game is over. The US will never be able to repay its debt, and our “representatives” in government, after at least pretending to care for so many years (even as they voted to continue to overspend and run deficits while decrying these very actions), now hardly mention the nation is actively drowning in debt. And we’re too far below the surface to ever get back. Yet logical panic has not set in. 40,000 leagues under the sea and counting, we breathe in debt as deeply and surely as a Scuba diver breathes in air. Yet he knows his time underwater is limited and never goes so deep he can’t resurface in time. The ability to get back to such an equilibrium, for the US, are long past. 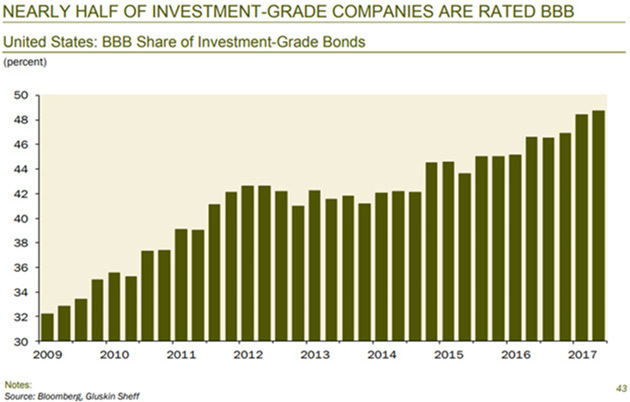 In the corporate sector, almost fully half of all corporate debt is rated BBB, which is to say, one step above junk. One step above “Yeah, they probably won’t be able to pay this back.” And this doesn’t even take into account that the rating agencies are notoriously lenient in their ratings. Moody’s was recently ordered to pay a fine of $864M (S&P was previously fined $1.375B) because it rated all sorts of subprime garbage as essentially risk-free. Because the companies that issued that debt paid these ratings agencies off. Their very existence is fraught with conflicts of interest. Regardless, for now, we spend, spend, spend, while we still can. Wall St. banks are more leveraged now than they were just prior to the 2008 crisis and subsequent Great Recession. Still, the unanswerable question that underlies our entire kingdom built of debt: While we all know the government will bail out the banks again, what happens when doubt in the value of the worthless fiat dollar reaches critical mass? Who will bail out the US government when it truly dawns on people that not only can it never repay its debt, but the day is coming when it can no longer even service that debt? It's still a bit mind-boggling that, even after the Great Recession, just a decade later the average non-financial business went from 3.4x leverage to 4.1x. They are now roughly 20% more leveraged than they were the last time all hell broke loose. CEOs and boards seem to have learned little from the experience—or maybe learned too much. If you believe the Fed has your back, then leveraging to the moon makes sense.